In these 2 photos of a purple iris I used a black cardboard as the backdrop. Dark backgrounds really make the colors of a flower pop and give the image a touch of elegance. Usually I choose a large enough black cardboard from Staples that I position behind the floral photographic object using the backrest of a chair for support. As a base I use the chair itself that I place in front of a window. The set up of my Macro Photography studio next to our dining room window provides exceptional and beautiful lighting conditions in the morning. White cardboards are used to enhance the light and direct the light towards the floral when it is facing away from the window. I always use a few hardcover books to stabilize and minimize any unwanted shaking or movement of the flower. Additionally the books make it easy to adjust the height of the flower when a different perspective or angle is more desirable. I often adjust the white boards to explore the impact on the lighting and better control the light on the flower. Adjusting the light with the white boards is a great learning experience for us photographers and often leads to more inspiring and beautiful fine art photography artwork. At longer exposure times a Tripod is a must. 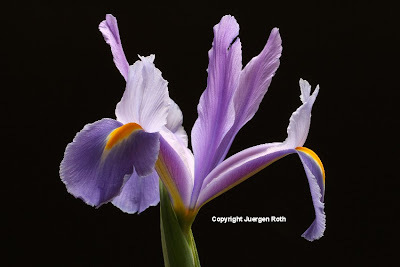 I captured this purple iris in landscape and portrait format and for me both images work. Landscape versus Portrait Format is one of the first decisions we make when taking a picture and here it worked in both captures. That is not always the case and then we have to decide on the best format to support the strongest composition. The light provided a beautiful illumination of the iris that keeps the viewer captivated. In the horizontal photograph the aperture of the Canon EF 100mm f/2.8 Macro IS USM lens was set to f/25 providing maximum Depth of Field and an exposure time of 4 seconds. The aperture in the portrait style flower photo was f/22 leading to an exposure time of 3.2 seconds. In both cases an ISO100 setting minimized noise. In the post processing steps I removed dust, minimally adjusted brightness, contrast and color saturation before sharpening the final images of this Iris over Black. Thank you so much for sharing this wonderful piece of information, Juergen! I purchased a large black foam board and am in awe of the results! It was your guidance that helped me capture one of my best...I look forward to your blog posts and your beautiful portfolio! Thank You!